Facebook showed me an "On this day" memory the other day. It was a photograph of my last visit to Le Manoir Aux Quat'Saisons ("Le Manoir") near Oxford, taken 7 years ago. Seven years, in which Britain experienced huge changes in the gastronomic landscape, certainly in London but also around the country. Things at Le Manoir haven't changed much. The location of the restaurant and hotel, with its beautiful grounds, is still stunning. Raymond Blanc is still an important and integral part of the restaurant and hotel, even though in recent years Gary Jones (executive chef since 1999), has been given a more prominent role, with his name and position clearly stated on Le Manoir's website and menus. And of course there's the two Michelin stars, held since 1984. Another thing that hasn't changed, is that the restaurant is open daily for lunch and dinner, and that an afternoon or evening at Le Manoir typically starts in the lounge area. A civilised and pleasant way to begin the experience, but to be honest, compared to seven years ago the room is showing signs of wear and could do with a touch-up. Anyway, in the lounge you can decide on the menu, whilst enjoying an aperitif and some canapés. 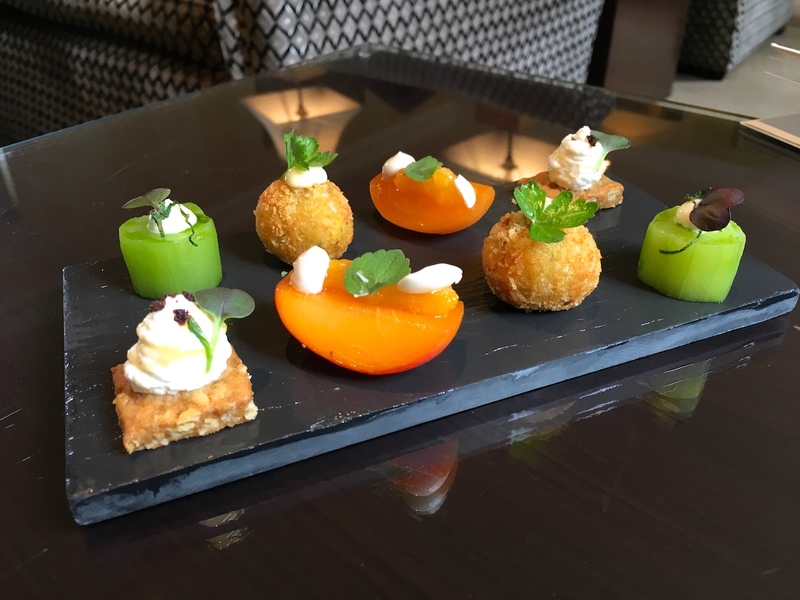 Today's canapés were a vegetable curry croquette garnished with some lime mayonnaise, compressed cucumber filled with wasabi cream, a biscuit with goat's curd and honey, and a spiced compressed apricot garnished with apricot chutney and almond crème. Four lovely, but not particularly exciting canapés. Since I was in for lunch one of my options was the 5-course tasting menu priced at £85 (excluding service), described on the website as "a distillation of intriguing flavours", but in the evening the menu (with different dishes) is sold as "very special ingredients sourced from the finest suppliers with a tempting, seasonal dessert" with a £141 price tag. Another option for lunch is was the 7-course tasting menu. In the afternoon "seven sensational courses showcase the season's finest produce" for £130, but in the evening the (different) "seven exciting courses, with unexpected flavour combinations, make this menu a real culinary adventure" for £162. And of course there's the a la carte menu (starters £48, mains £50 - £58, desserts £32). In the end I decided to go for the 5-course tasting menu, especially since the "sensational" difference between the 5 and 7 course menus was an extra cheese course and an extra dessert. The main course on the menu today was lamb, which I requested to be replaced by chicken. 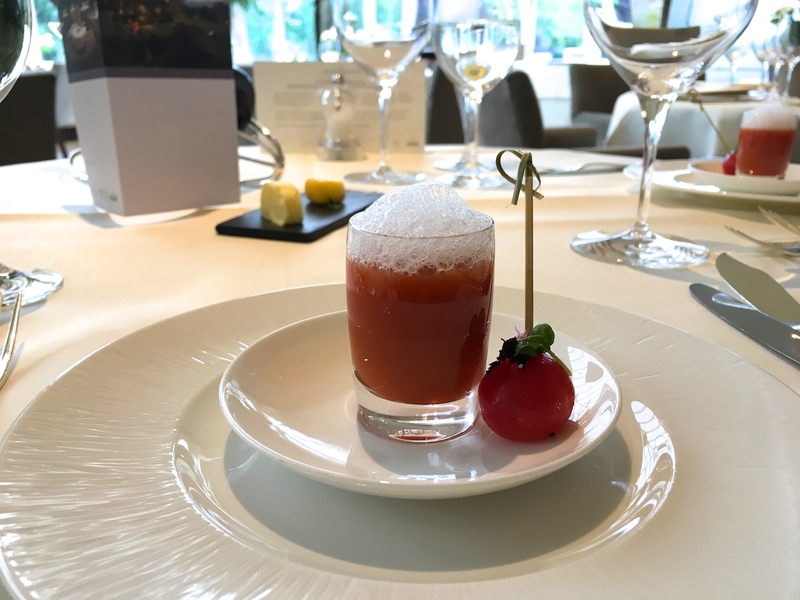 The first course, described on the menu as "Chilled gazpacho, cherry tomato and olive", turned out to be an amuse bouche-sized dish of a well-seasoned gazpacho and tomato essence foam served in a shot glass. On the side came a (whole!) confit cherry tomato with black olive crumble. Second course was a piece of confit cod served on top of some nice and smoky red pepper fondue, and topped with chopped fried chorizo and crisp croutons. Also on the plate was a bittersweet red pepper sauce, two pieces of tender octopus, olive oil jelly, a chorizo and potato beignet served on some coriander crème, and finally a garnish of leaves. There were some nice elements in this dish and the cod with the red pepper was a lovely flavour combination, but nothing on the plate stood out and I didn't really get the leaf garnish. 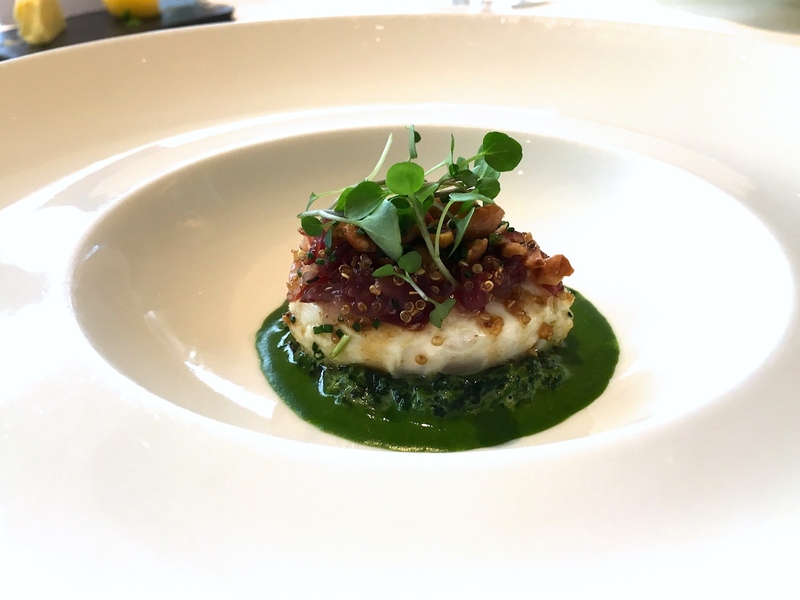 This was followed by a pretty dish of soft hen's egg served with wilted spinach and watercress puree, and the egg nicely garnished with strips of Jabugo ham, toasted chopped hazelnuts and crisp quinoa. A pleasing and comforting combination of flavours. 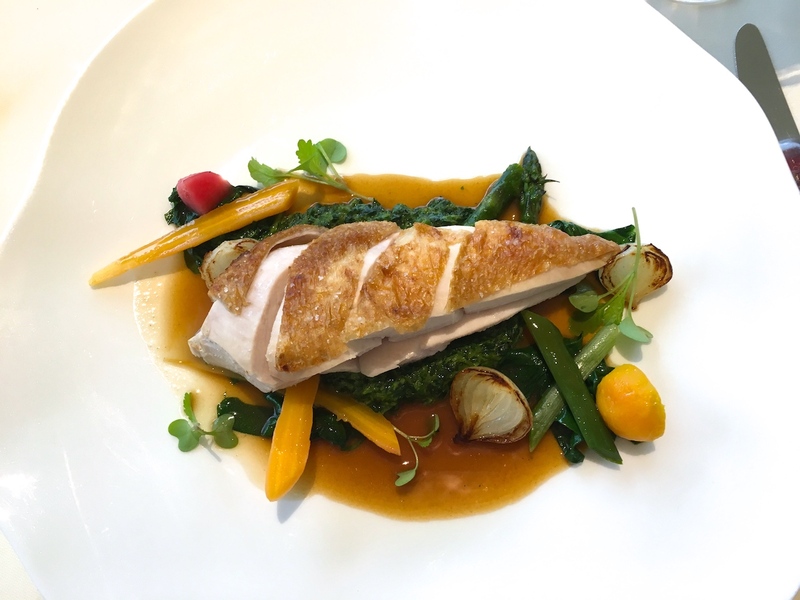 My main course was tender roasted chicken breast served with grilled baby onions, baby carrots, a whole lot of wilted spinach, yellow beetroot, green asparagus and jus made from the chicken's roasting juices. A good, well-cooked dish, but at the end of the day it was just chicken-and-veg. I wasn't too impressed by the quality and flavour of the chicken - which could have made all the difference, even in such a simple dish. The best dish of the day was dessert. 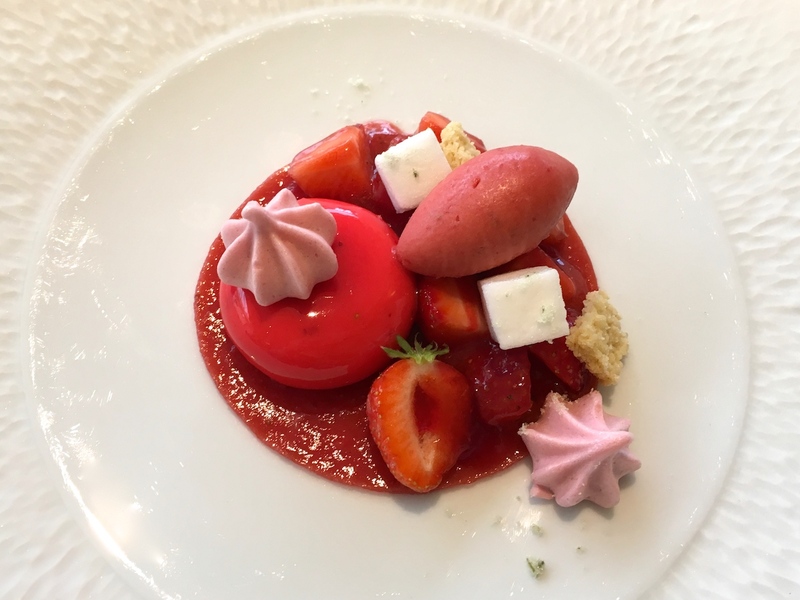 An excellent cheesecake with a shiny strawberry glazing and a wonderful red pepper jelly centre and accompanied by cubes of white basil foam, a well-made, intensely flavoured strawberry sorbet, marinated strawberries, and a few delicious cotton candy meringues. A delightful dessert showing creativity and skill. 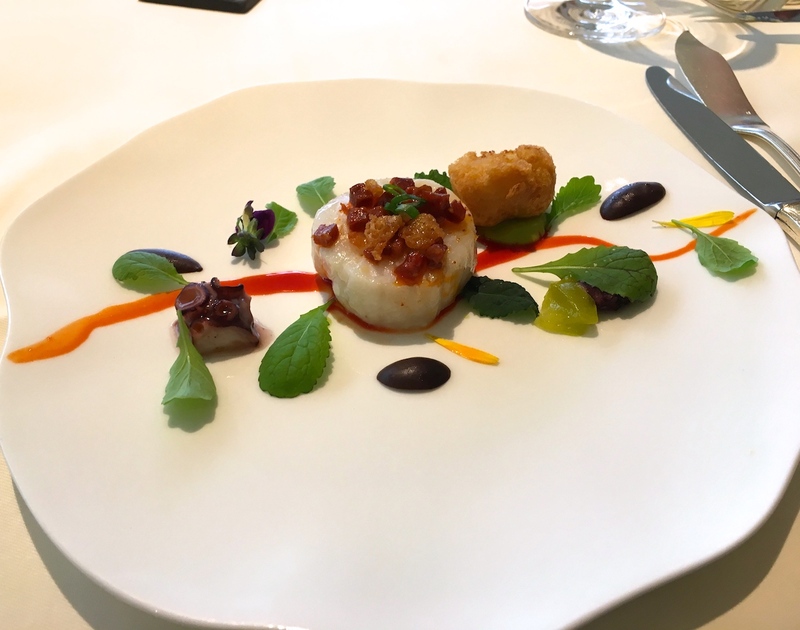 So, one thing that has changed at Le Manoir in the last seven years is the food (even here quinoa has made its way onto the plate), but not for the better. I still remember my meals (I had lunch and dinner) from 2010, but particularly dinner, when I had the then 5-course "Menu Classique", which included a truly exquisite and most memorable summer vegetable risotto with tomato essence, mascarpone and garden herbs. Today's five course menu (effectively four courses) didn't feature any eye-catching special produce or any outstanding craftsmanship or intricacy. No memorable dishes or anything to marvel at. 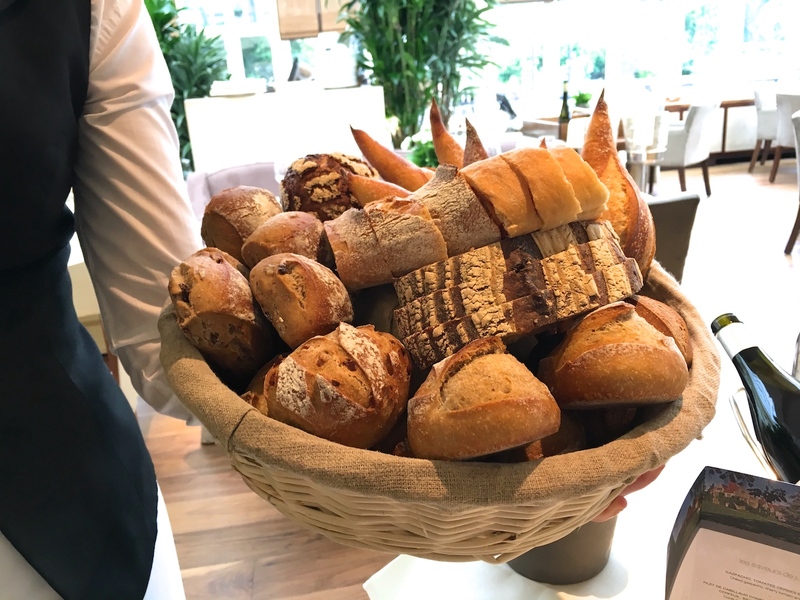 Well, the bread is still outstanding, but I didn't come to Le Manoir to stuff my face with bread. This was just a good meal with decent ingredients, sold for a magnificent price - the only thing at two-star level today.